This comes from Hiway 1 in Northern California. After I finished my radio show in 2010 I worked on a political campaign until early November then took a drive up through the Napa Valley and down the coast through Mendocino. This comes from that trip. I liked that tree hanging over the road and the birch trees. Notice the the dark blues for the shadows in the trees on the left, the softer blues in the bushes on the right, and the dark reds above that bush. Together they make the orange tones in the trees pop and form two "V's" with the Lapis Lazuli of the road to sweep the viewer up and through the picture. PaulB's Pointillistic/Impressionist original oil paintings of California and various prints and poster formats of a wide variety of subject matter by the Pointillistic/Impressionist oil painter from landscape/waterscape paintings, dance, sports, portrait, to classical figures, flowers, rock and roll, Brazil, and California paintings and prints are available for purchase for as little as $24.95 for an 8" x 10" matted print on photo pape. 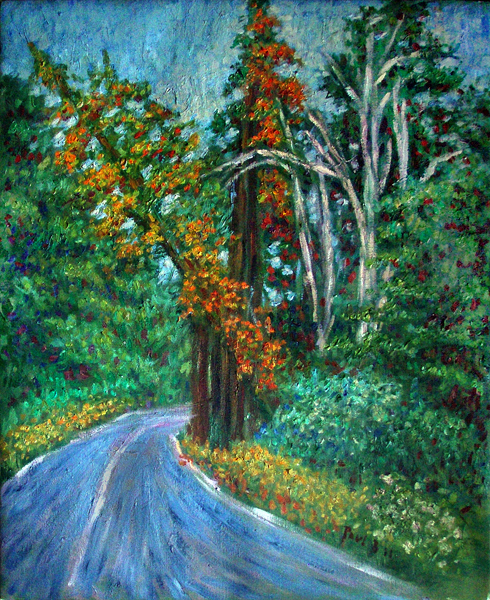 Pointillistic/Impressionist Giclee prints of California on real canvas or heavy watercolor paper are available. One of a kind California embellished prints, which are Giclee prints retouched in genuine oil paint by PaulB. Unless noted PaulB's original Pointillistic/Impressionist oil paintiings are oil on canvas. Paul Berenson's pointillistic/Impressionist oil paintings are in privale collections around the world, including the downtown Los Angeles Athletic Club and have appeared in numerous publications, including the New York Philharmonic Playbill. PaulB.com also builds websites and PaulB is a member of the LA Web Professionals Group.